If you review email as it arrives in your inbox, you are lowering your productivity. Email can be as much of a distraction or lure as YouTube or online shopping for many employees. Email as a medium of communication has leaped from purely business to a social communication vehicle. Corporations must deal with excessive amounts of spam, personal and business related e-mail that all directly impact employee productivity. A study found that “nearly a quarter of all corporate e-mail is personal in nature“. 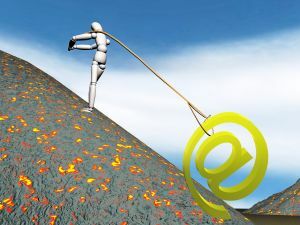 Frequently checking new email messages breaks concentration, changes focus, and elevate new e-mail messages to the highest priority task regardless of what is, or should be, the actual highest priority task. Under most circumstances email should be checked once an hour to once every other hour. Making this change will have a huge impact in employee productivity. Most people should not fear making this change. Email is a tool and should not become the master of employee days. Management should set an acceptable response or review time for email throughout the organization. If issues are critical in nature, then colleagues can contact one another by phone or in person. For critical issues this would be the preferred communication method anyway. A research study, “Case Study: evaluating the effect of email interruptions within the workplace” authored by Thomas Jackson of Loughborough University found that 70% of arriving emails were reacted to within 6 seconds. Once the email was addressed, it took an average employee 64 seconds to resume working at the same rate they were before the interruption. Think about how many messages are sent and received in a company each day. It would not be uncommon for the multitude of managers, middle, and senior management to receive hundreds of messages each day. This can be a dramatic draw on managements time and attention. If an employee has set up the email application to check for email every 5 minutes then it is possible, if (s)he is a heavy user of email, that there could be 96 interruptions in a normal 8-hour working day. However, if the email application was set up to check for email every 45 minutes then the number of possible interruptions is reduced to 11 per day. Think of all the lost productivity with 96 interruptions in a day. Did all those interruptions warrant an immediate response? Were they the highest priority task that should have been addressed or did they reduce employee effectiveness? Changes in email habits are never easy in the age of instant response expectations, but setting a regular schedule of checking e-mail can increase employee productivity significantly. For a company wide change to be successful the full management team must be supportive of the new standard. If it is implemented correctly, the company should achieve higher levels of productivity and better communication between employees.